For those of you who are following the story of our friends Pat and Kim who are adopting the baby from China, here is a picture of Kim with beautiful Hadassah. These pictures of Pat and Kim with Hadassah brought tears to my eyes. I have been praying for an entire year for them to be able to adopt her. GOD ANSWERS PRAYER! Hadassah is bonding very quickly with Pat and Kim, praise the Lord! She smiles, laughs, and plays with them. She is eating very well (table food and milk). They have taught her to wave goodbye, to blow a kiss, to say a few English words, and other things. Kim said she is very smart and is picking up things quickly. She sleeps well at night, but doesn’t like to take naps. She loves techno gadgets like the t.v. remote and the computer, lol! Pat and Kim are now the legal parents of Hadassah according to the Chinese government. Now the paperwork is being finished to make them the legal parents according to the U.S. government. Hadassah went for her medical check-up today in China, and had to get six shots to enter the U.S.! They are also getting her visa and passport, and will go on a city tour. They have an appointment with the consulate, and then will take different flights to get back to the U.S. by Christmas Eve (a total of 18 hours flying – please pray grace for them and the baby on these long flights. I am praying she will sleep while flying!). Meanwhile back home at the ranch, Pat’s and Kim’s three kids are doing well with me and their grandmother here (I leave here tomorrow for home in Kansas City, MO, and grandma stays for a month). The kids are so excited about seeing their baby “Sissy” on Christmas Eve. 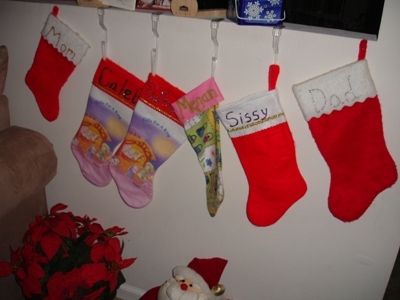 Her Christmas stocking is hanging up with the rest of the family’s for the big celebration day here at home. The kids get to talk with and see Pat, Kim and Hadassah by web camera each morning and night. Hadassah tries to touch their faces on the monitor and smiles at them! She has blessed our hearts, and makes us all laugh. She is just precious! 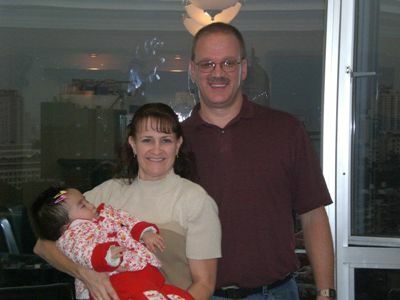 Thank you so much for your continual prayers for Pat and Kim in China, as the paperwork is finalized for Hadassah’s adoption and for their long flights home to Florida. This story is a powerful testimony of God’s goodness and grace! Just as Pat and Kim desired to love and adopt this beautiful little girl who was abandoned as a baby on the streets in China, taking her into their own family, God loves you and has adopted you as His very own child – to show you His goodness and His blessings that He has for you. I told my friends Pat and Kim about you, and sent her the link to your blog. I like your blog. That is so awesome how yall have adopted all those beautiful children! Kim, that is awesome! Praise the Lord! Thanks for this comment and I will share this with my friends! Congrats to them! We have adopted 10 times… it’s amazing each and every time!! !